Once there was a sheet of brown packaging paper inside an open box, wrapped around an expensive stand mixer. Today was the big day! It was his first job. He looked down the assembly line at the other boxes getting taped up for delivery. His future was awaiting. Where would he be shipped to? “Oh no, not this again.” A voice in the box to his left whimpered. He tried to lean over to see, but the other paper was hiding deep in his box. “What’s wrong?” he asked him. The brown paper was at a loss for words. He hadn’t thought about what happened after delivery. They didn’t mention this at Orientation Day. “Oh don’t listen to that old timer.” The paper in the box to his right spoke up. She lowered her voice. “He used to be a newspaper.” Then she flashed a smile. “Life is great – especially in the fast lane. I have flown to 35 States already.” The paper preened her glossy coat patterned with the words “2-Day Shipping” in blue print. Suddenly a pair of hands lifted her from the assembly line. “Whoops, gotta go. My jet is waiting for me. Good luck out there!” She waved. When he woke up, he saw a light shining in from the corner of the box. Oh no, the box is torn! He folded himself into the corner to pad the mixer. The ground rattled and shook. I must be on a truck. He thought as he remembered Orientation Day on the first day of work. At that point, he was a smooth and flat sheet, fresh from the press, standing with hundreds of other sheets as they were instructed on what to expect and how to do their job. 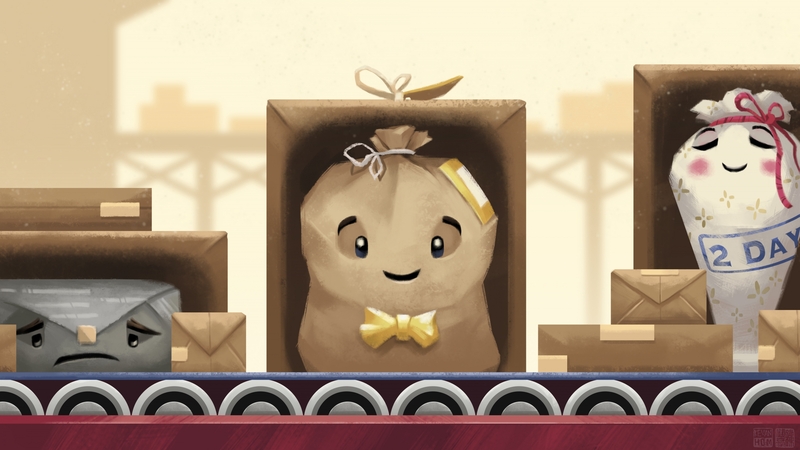 As the delivery truck rattled through main street, the brown paper peeked through the hole in the box and then slid up just far enough to see through the window. He gasped at the gift shops and stationery stores. Displayed in the windows were the most beautifully printed papers, with fancy edges and shiny metallic paint. People fussed over them, arguing over which was the prettiest. The brown paper had heard from his friends about these pretty printed papers and how they were used to wrap gifts. Well, they are pretty. But they aren’t sturdy enough to do a tough job like this. He held the mixer with pride. Finally, the truck jerked to a stop and the truck door clattered open. Light flooded in and the brown paper dove back into the hole in the box and held his breath. They had arrived! The man tossed him roughly onto a doormat in front of a house. Hey, careful with the goods! The paper wanted to shout. A dog barked from inside. As the truck drove away, the paper slid partially out of the hole to take a look. It was a quiet and clean tree-lined neighborhood with manicured gardens. There was a pot of flowers next to the doormat in front of a red door. It looked like a nice home. The paper smiled. Now, it was time to wait. The paper watched the sun crawl across the sky, hummed along with the birdsong, and enjoyed the breeze. At last, a minivan pulled into the driveway. The dog started barking and the brown paper counted them as they got out: A father, a mother and a girl. A family of three! The paper retreated back through the hole and listened to the muffled voices. “Ooooh, is it the fancy one that can mix cookie dough and cake batter? I wanna see!” She jumped up and down. The paper felt the box get lifted and it hugged the mixer tight. “Lemon cake! Can we make two? I want a loaf!” She rushed into the house. The dog jumped on her and licked her face. The brown paper trembled with anticipation. What a lovely family! He would love living here with them. Maybe they’d give him his own room. He felt the dad slicing open the tape on the box. “Oh no, there’s a hole in the corner here. Hope it didn’t get damaged.” The brown paper puffed up. Not a single scratch, he thought proudly. The sides of the cardboard box pulled open and the brown paper looked up at their eager faces. They were such an adorable family. He smiled. Then the dad grabbed him by the neck, crumpled him in his hands and tossed the poor paper over his shoulder. He landed in a recycling bin. “Score! I knew I should have tried out for the basketball team when I was a kid.” The dad joked. They laughed. The girl glanced at the paper in the bin a couple times, as if making a mental note. He watched her with pleading eyes. Save me! But they turned their backs on him and leaned in to admire the shiny purple stand mixer. He sank into the bin. The brown paper thought about what the crazy old paper at the assembly line said. He tried to think positive thoughts. At least this family recycled. It was less smelly here than being wrapped around a dead fish or pooped on by pet birds. Soon, whiffs of fragrant lemon and butter drifted in from the kitchen oven. He never knew anything could smell so good. He peeked over the top of the bin and saw them washing out the mixing bowl and looking in through the oven window. Well, he did his job right? Look how happy they are. He smiled a sad smile and crawled back into the bin. After a while, the house got dark and silent. What’s to become of me now? He sighed. Long hours passed in the dusty bin. He couldn’t tell what time it was anymore. Suddenly, the bin moved and a bright spotlight blinded him. A pair of small hands dug in and pulled him out. It was the girl – Cassie! She took him inside her room and carefully smoothed out the wrinkles. Then, under the beam of the flashlight, she used a purple crayon and started drawing a heart pattern along the edge. What was happening? He felt warm all over as she drew heart after heart along all four edges. She was so gentle that it tickled. The paper giggled. Then Cassie pulled out a lemon cake in an aluminum loaf pan with a plastic lid. 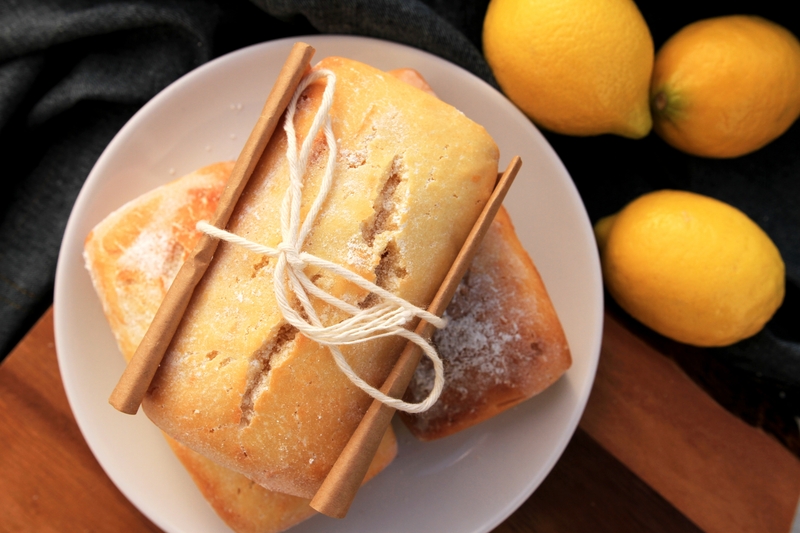 She carefully wrapped the brown paper around the lemon cake, taped the ends, and tied him with a purple ribbon. She glowed at her work of art. As she tucked him into her backpack, the brown paper vowed to protect the lemon cake to the best of his ability. He had a new purpose! The next day, Cassie brought the package to school. The teacher received gifts from all the students, some in beautifully designed gift bags or wrapped in pretty paper. The brown paper felt embarrassed to be sitting next to them. But Cassie didn’t seem a bit ashamed. “And who is this present from?” The teacher asked, picking up the brown package. “Mine!” Cassie shot her hand up in the air. “My, how creative! You made this into the wrapping and card all in one! I will keep this paper.” The teacher smiled and leaned in close. “This has been my favorite gift of all. Do you know why?” The girl shook her head. “Because there is no other one in the world that is exactly like it.” She gave the girl a hug. The brown paper teared up. After school, the teacher took the brown paper home and hung him on her refrigerator door with a couple of magnets. He looked around at his new home. The retired life was not so bad after all. Bring the eggs and butter to room temperature. Preheat oven to 350 degrees F and grease the loaf pans. Beat the softened butter for 1 minute with electric mixer. Then, add the sugar and beat on medium-high speed until it is light and fluffy and pale in color, scraping down the sides as needed. Add the lemon extract to the mixture and then add the eggs one at a time, mixing between each egg addition. The batter may look a little curdled, but that’s okay. It will smooth out once the flour is added. In another bowl, add the flour, lemon zest, baking powder, baking soda and salt, and whisk together. In a separate cup, combine the sour cream, water and strained lemon juice and stir until combined. It should look like watered down milk. Add the flour and lemon juice mixtures, alternating between the ingredients, to the batter, beginning and ending with the flour while mixing on low speed. You’ll end up adding the flour mixture in 3 additions and the lemon juice mixture in 2 additions. Divide the batter evenly between the loaf pans and smooth the surfaces with the back of a spoon. Bake between 30-40 minutes, or until toothpick inserted into center comes out clean. The cakes should be golden in color and may have some cracks. Sift powdered sugar over the tops to finish and let cool for 15 min before serving. 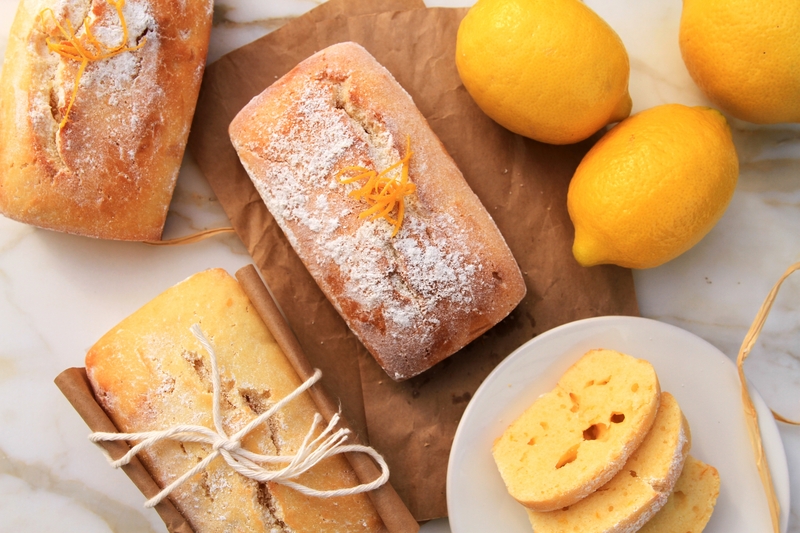 Many lemon pound cake recipes have a simple syrup (made with sugar dissolved in lemon juice) that is spooned over the cake after it has finished baking. This makes the cake more moist and have a stronger lemon flavor. In addition, some people poke holes in the cake with a toothpick or skewer so that the syrup can sink in easier. If you’d like to have a loaf with less sugar but still want it to be more moist, you can skip this step and substitute it with blueberries. Simply toss a cup of blueberries in a couple tablespoons of flour, and then fold them gently into the batter before pouring the batter into the pans. Why is the paper brown? Paper is made from the pulp of wood fibers and is naturally brown. The white paper that you commonly see everywhere is only white because it has been bleached. What is special about brown paper (such as Kraft) is that it decomposes naturally in a few weeks just like the dead fallen leaves of trees. The paper is biodegradable. It is also recyclable and because of its long strong fibers, it can be recycled multiple times. Brown Kraft paper is also used to make the brown paper bags you see in grocery stores because it is thick and durable. As a kid, I made book covers from brown grocery bags to wrap my textbooks. Over time as the cover got worn, it would become soft and a bit fuzzy, and I loved how it felt when I held it in my hand. I also took pieces of grocery bags and crumpled them over and over until they became soft and fuzzy and then drew maps on it to play make-believe pirate treasure hunts. I ordered a shiny new purple Dyson vacuum that arrived in a box with a very large sheet of brown paper packaging wrapped around it. Of course, I immediately wadded it into a ball and tossed it into the recycling bin. But since it was so large and relatively free of wrinkles, I felt a twinge of hesitation as I crumpled it in my hands. Was I feeling guilty because it was essentially a new sheet of paper? But it was created to be used as padding for shipping, and it had done it’s job, so why was I worried if it had feelings? I sat down to write this story to make me feel better and ultimately used the paper as gift wrap tied with twine. This cake is very delicious. Thank you for posting this recipe! The story is adorable. I like how you told the story from the perspective of the paper. How creative! Thank you Brian for your wonderful poem!